Sun Realty is proud to offer our guests the best possible value on Outer Banks vacation rentals! Click on the links below to find discounts on Outer Banks rentals , special packages, new listings and more. These offers won't last long. Availability is limited, so be sure to reserve your Outer Banks vacation as soon as possible. Need some help? Call us at 1-888-853-7770 and we'll help you find the perfect OBX vacation home for your budget. 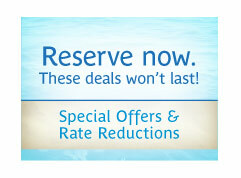 *Please note that Rate Reductions and Special Offers are only available for new reservations (not retroactive).